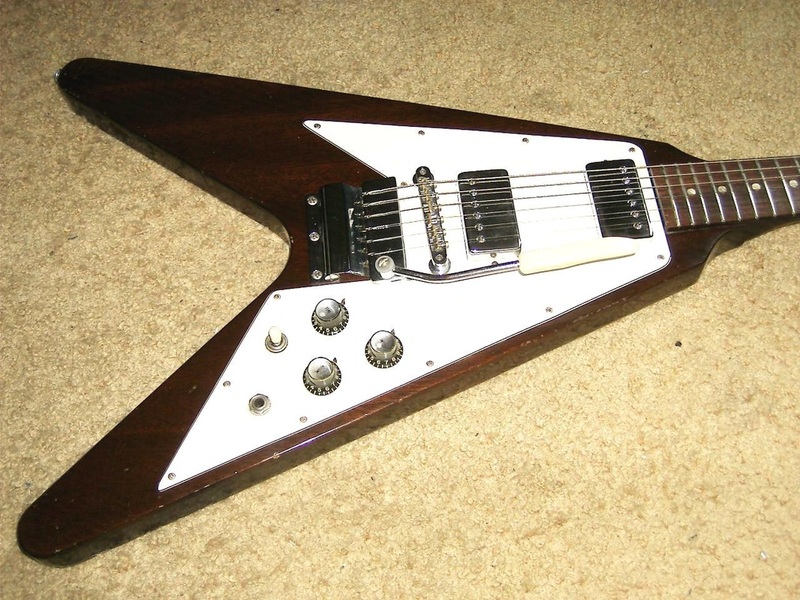 The last batch of 35 Gibson Flying V's (Batch #5) were all finished in Walnut and built in 1969. All of them shipped in 1970. Strangely enough, they all have 1968 serial numbers. The finish is also called Natural Walnut. These gems are rare.....there are only 35 of them on the planet. 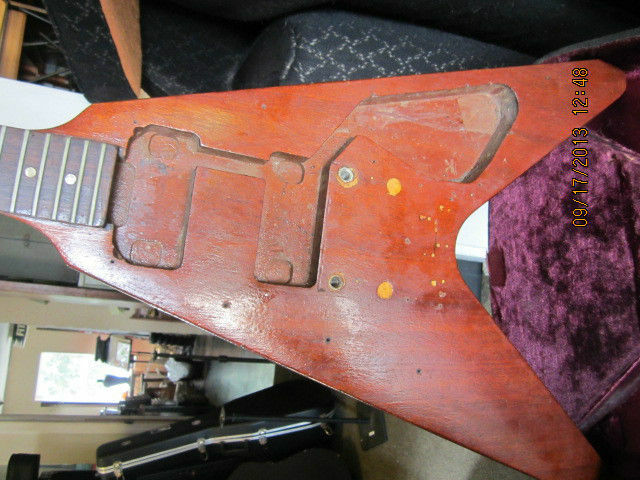 Gibson started using this finish on many of their other guitars around the same time, including the ES-335 and SG, etc. There are several distinct characteristics of this last batch of V's. They have a three-piece neck. They have the short neck shelf like the V's from Batch #1. 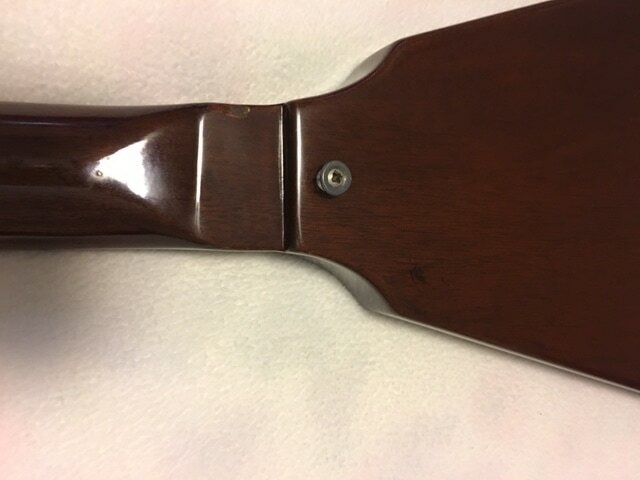 The front of the headstock is the same color as the rest of the guitar (walnut), whereas all of the other Flying Vs, have a black headstock front. 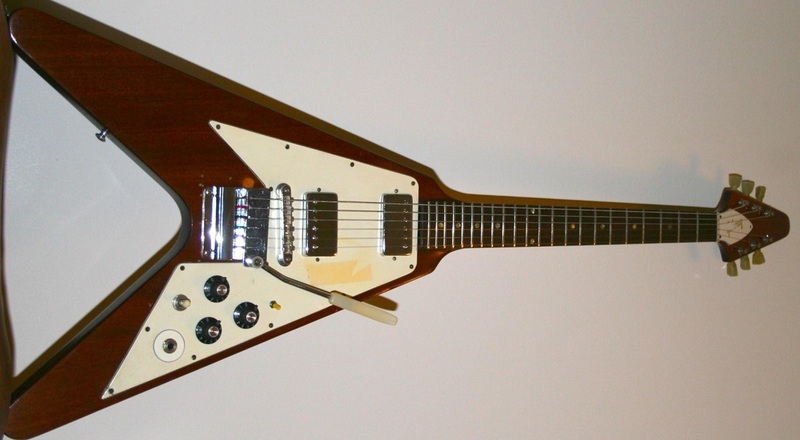 However, there is one 69 Walnut Flying V that does have a black headstock. It is pictured below. 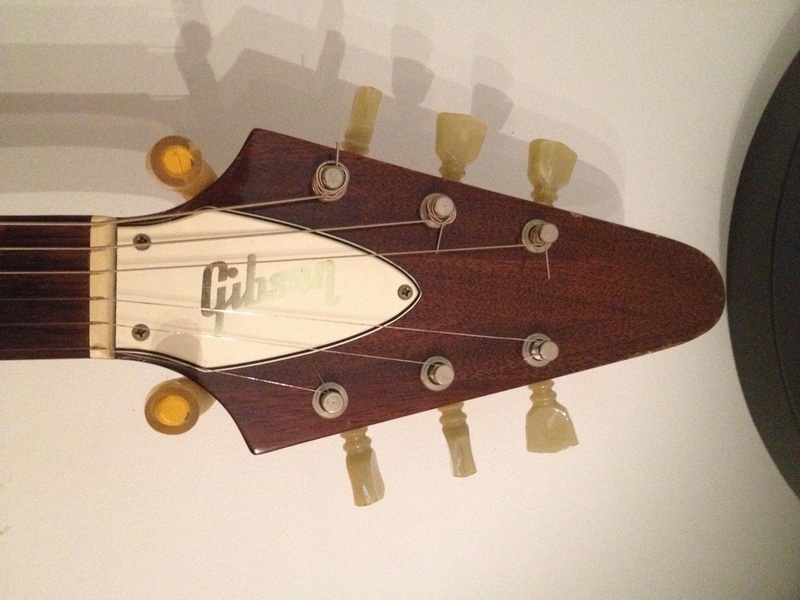 The tuners say Gibson Deluxe not Kluson Deluxe. 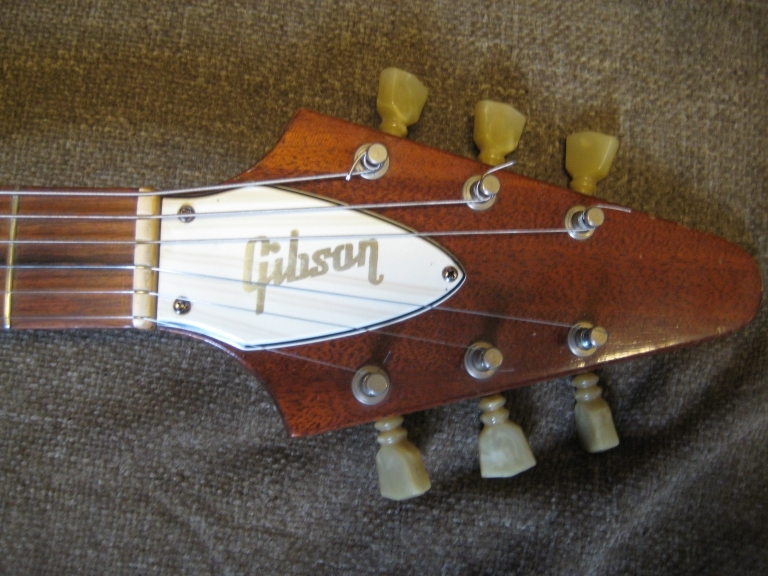 And finally, they have a large rounded neck which was typical of all 1969 Gibson guitars. The larger neck is highly desired by most players. 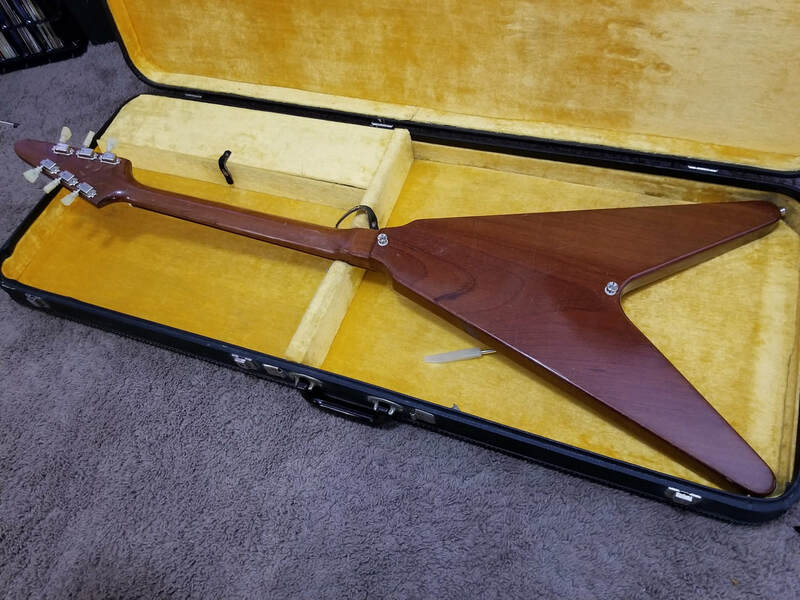 Leslie West, the guitar player from the rock band Mountain, had two 1969 Walnut Flying Vs that he used in the early 1970's. Both were heavily modified. 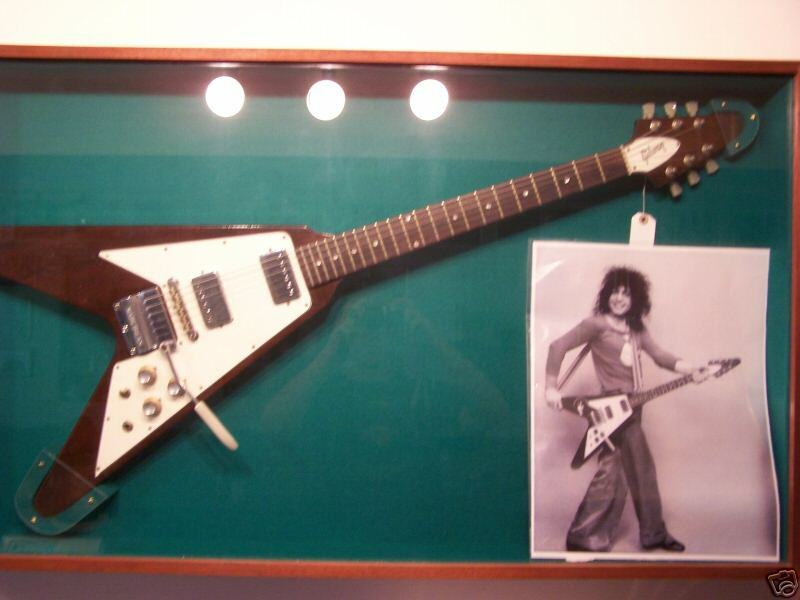 Also, Marc Bolan of T. Rex fame, owned a 1969 Walnut Flying V that he played in the 1970's. 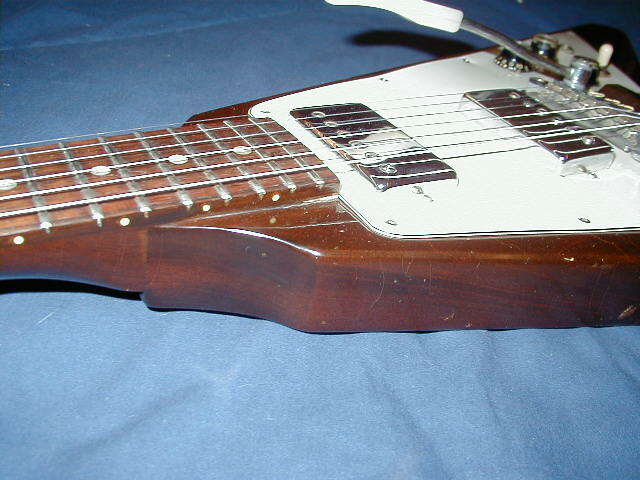 The 1969 Walnut Flying Vs came with the standard Faultless square case that had the gold stenciled Gibson logo on the front and back. 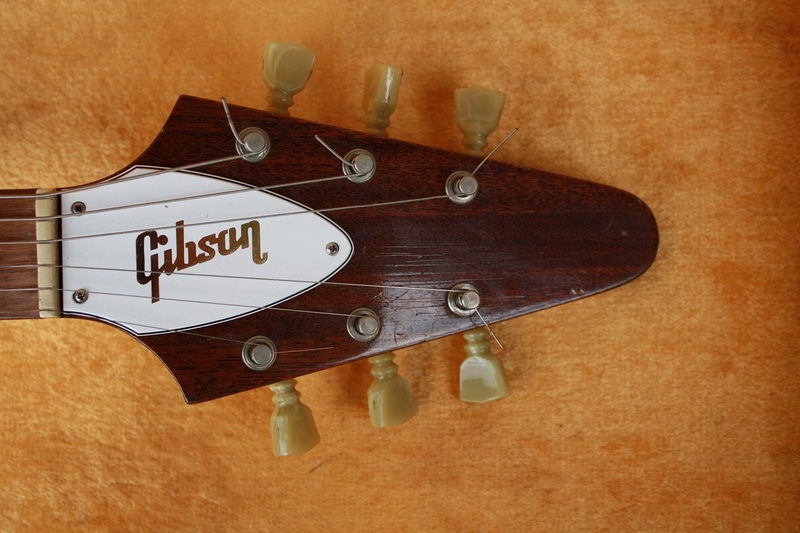 1969 was the first year the gold stenciled Gibson logo appeared on the Faultless cases. There are probably less than five Walnut Flying Vs on the planet that are still factory original, unmolested and unbroken. Pictured below are several Walnut examples. NOTE: There were at least five 1967 Gibson Flying Vs that were probably built as Batch #3 or #4 guitars that were all walnut. 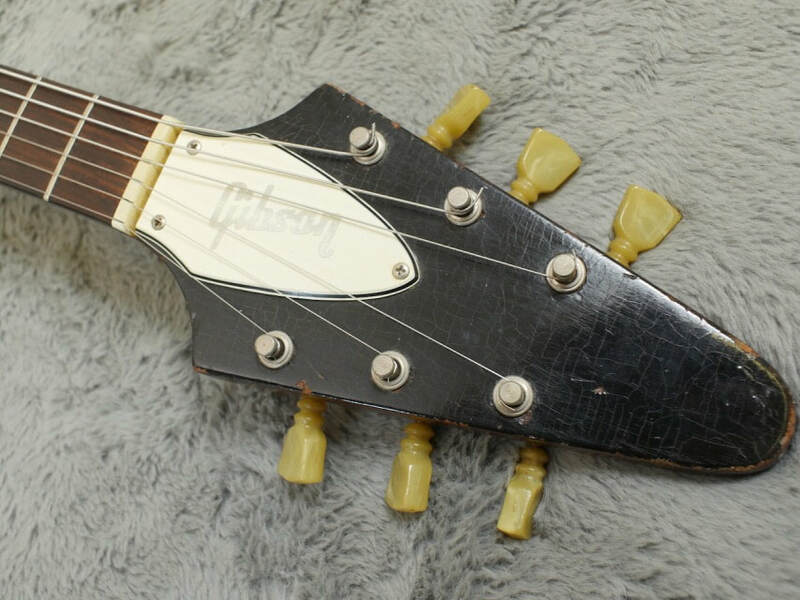 They also have black headstocks which makes them rather unique. All have the longer V shaped neck shelves indicating Batch #3 or #4. Two of them have very high serial number (954860 and 954861) and were probably two of the last Flying Vs that were built from Batch #4. All five guitars could also be 1967 Flying Vs that were completed in 1969 and shipped from the factory in 1970 with the rest of the Batch #5 Walnut Vs. 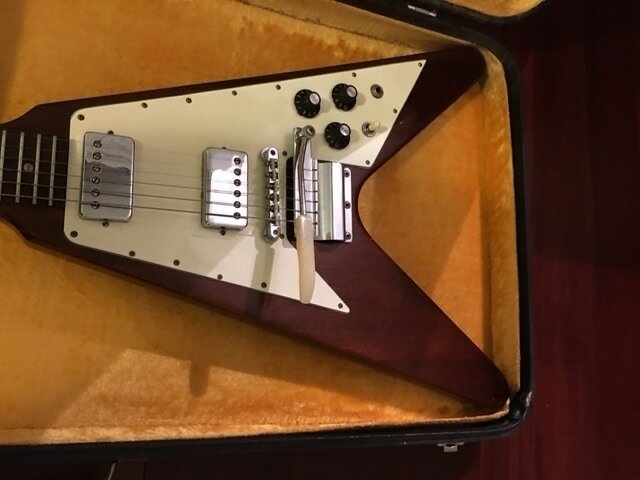 But, since all five Vs have all of the characteristics of the Batch #3 and #4 Flying Vs, including the correct case with inner case lid and no Gibson logo stenciled on the case, that is most-likely what they are. 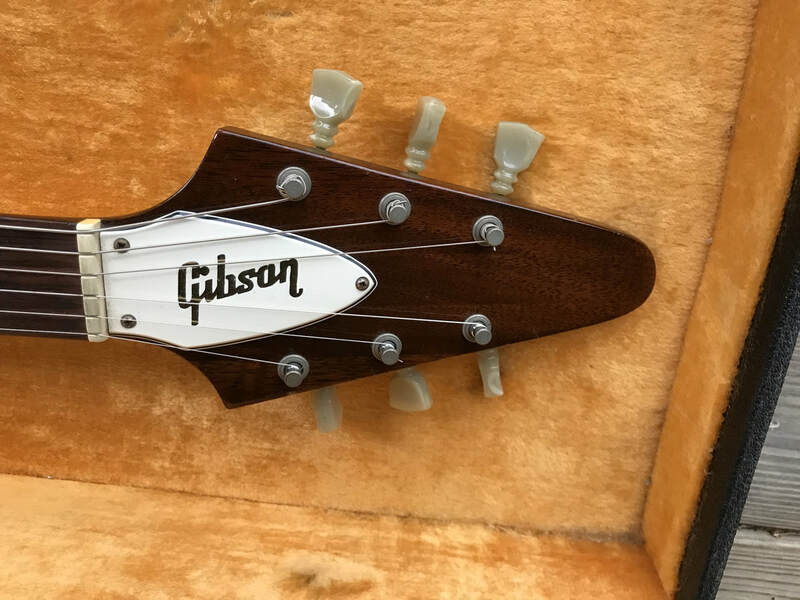 Note: Typically, Gibson did not start using the all Walnut finish until 1969, which complicates the mystery as to their year of origin. These five unique walnut Flying Vs are documented in detail, towards the bottom of this web page. Serial Number 906932. 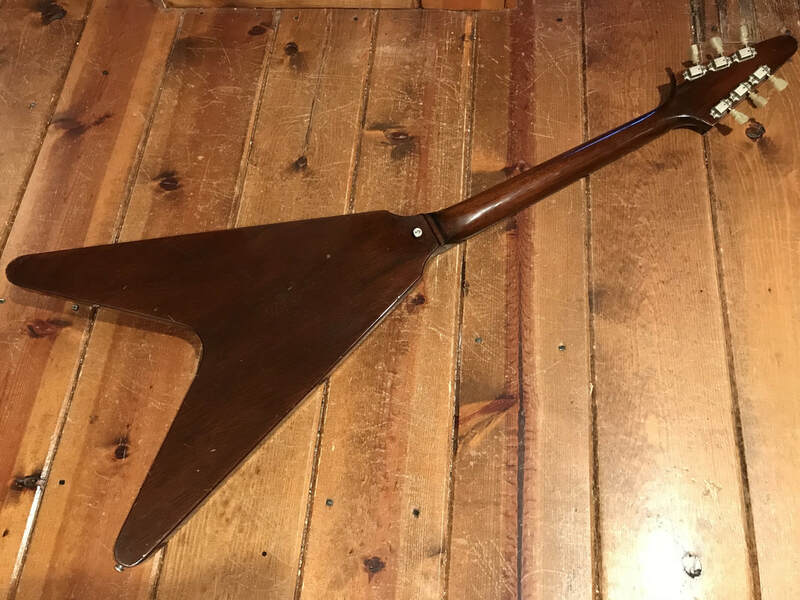 I purchased this incredible unmolested 1969 Walnut Flying V in June of 2018. The previous owner bought it in 1972 in northern California when he was just a kid. This V "lived"in the same northern California area until I bought it. It is factory original, unmolested and unbroken with no holes and no mods. It is one of only a few walnut Vs on the planet that has the distinction of being factory original and unmolested..... just some dings and scratches from being played for 45 years. It still has its original yellow-lined square case. 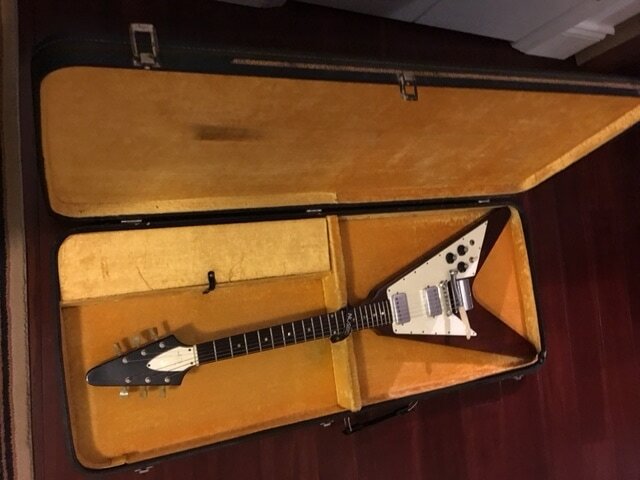 Thank you Dan for selling me this incredible Flying V. Posted July 2018. Still has the original black tape holding down the wires. It has never been removed. Serial Number 90709x. A nice example that I owned for over 10 years. I bought this guitar from a dealer in Tokyo, Japan in 2003. 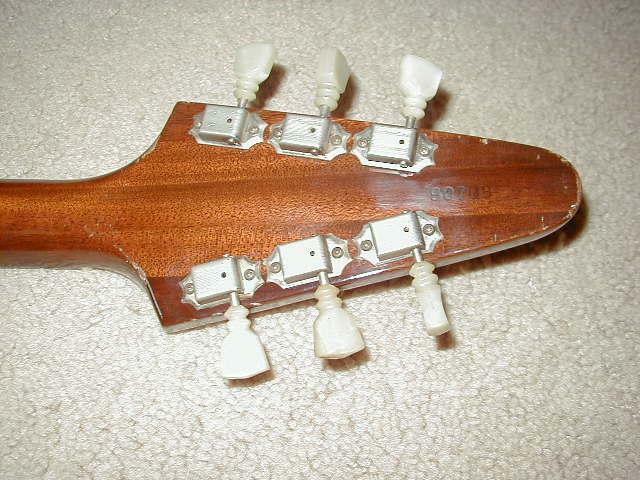 It had Grover tuners installed at one time. This is the best playing Flying V that I have ever played. I sold it to a collector from New York in 2012. Notice the three piece neck in the below Picture. Notice the short neck shelf. The short neck shelf only appeared on Batch 1 and 5. Serial Number: 926930. 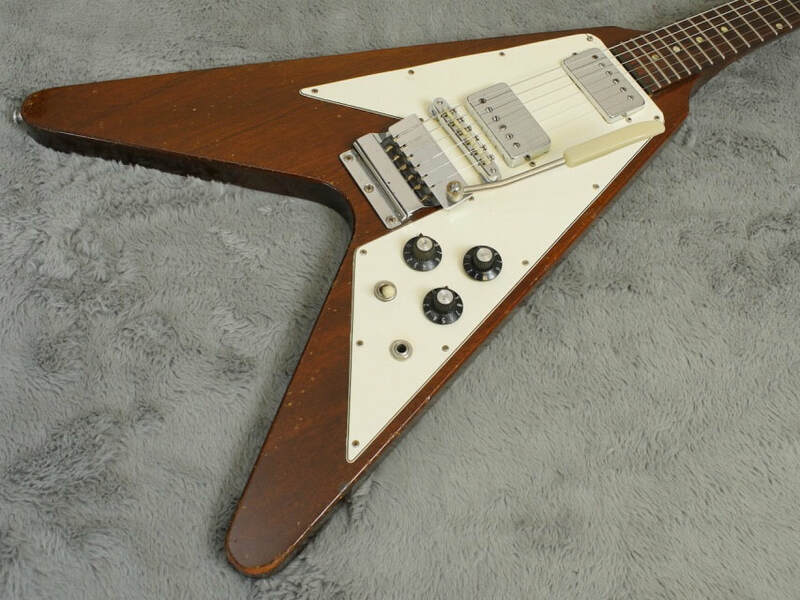 This is probably the cleanest '69 Walnut Flying V on the planet. It was sold in Japan in 2010. The case in non-original. Serial Number: 907116. 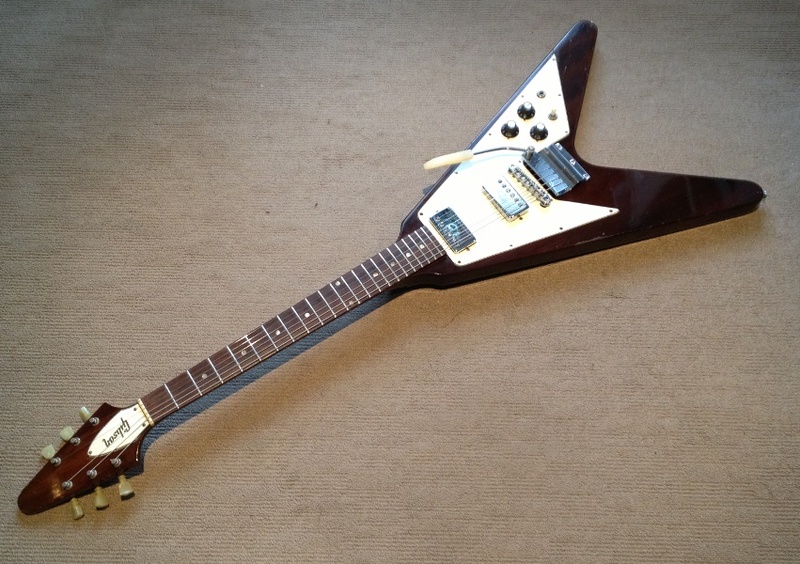 This guitar was owned by Marc Bolan of T-Rex back in the 1970's. After his death in 1977 it changed hands several times. In April, 2007 it sold at Christies Auction House in England for $72,180. Pictured below are a few shots of Marc Bolan with his Walnut V. Some of these pictures would have been taken prior to 1977 when he died in a car accident. Serial Number: 906948. A very nice example that surfaced in 2012 and was privately sold. 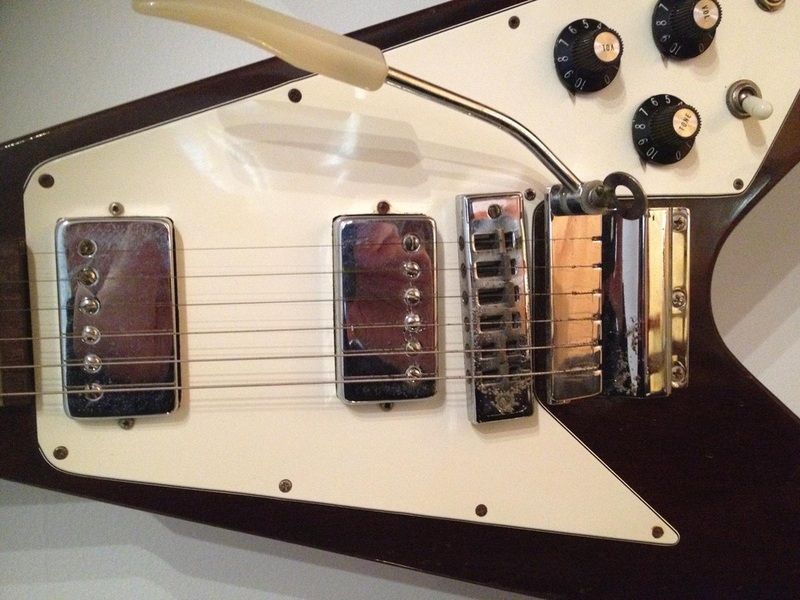 The original ABR-1 bridge was removed back in the early 1970's and was replaced with a Gibson Harmonica style bridge. Other than that it is all original. 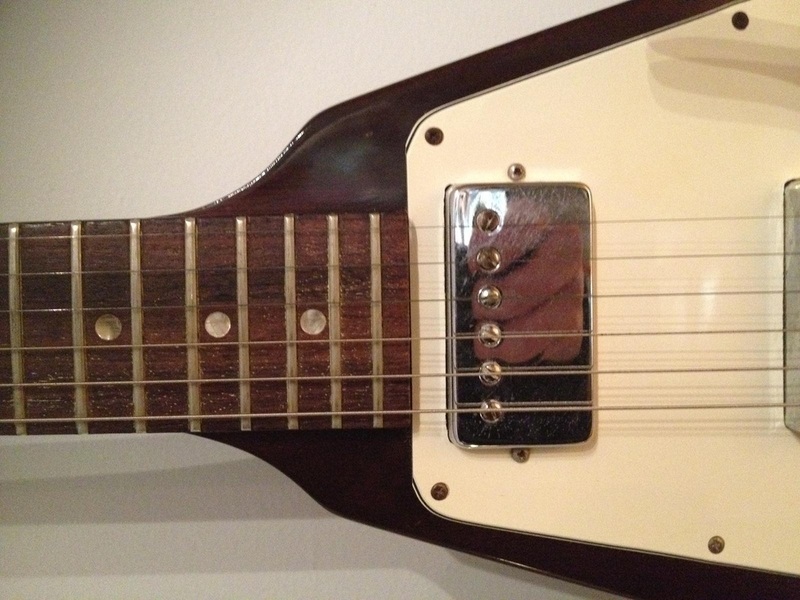 Here are some pics of the same guitar shown above with the Harmonica style bridge replaced with the correct ABR-1 bridge. Serial Number: 907212. Another nice example that surfaced in England in 2011 and sold soon thereafter. 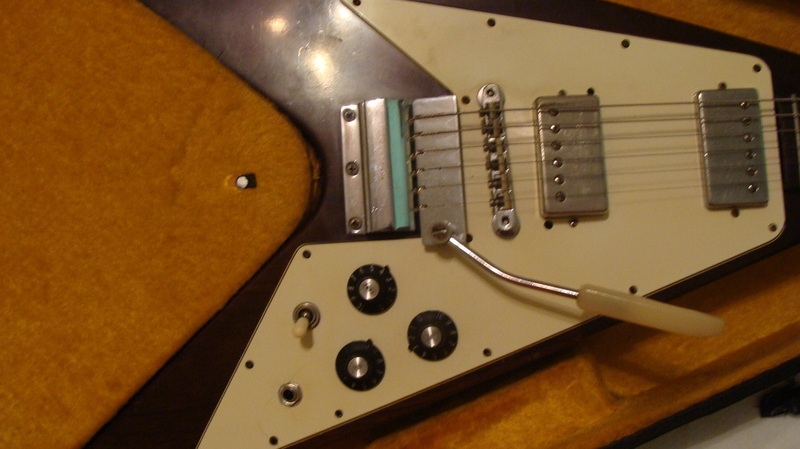 Notice the pickguard mod in the area of the bridge position pickup (additional adjustment screws added). This guitar has surfaced twice over the past 11 years. It is currently owned by a collector who lives in Canada. This one is in rough condition. Serial Number : 907600. This guitar was refinished cherry and then refinished again back to Walnut. Notice the cherry stain in the area of the serial number from one of the refin jobs. 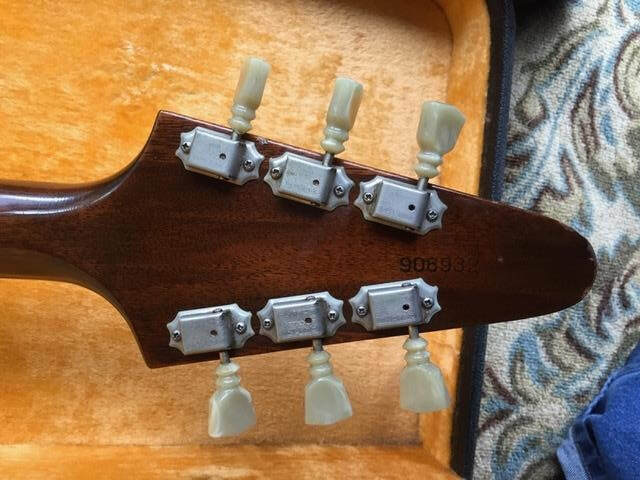 Serial Number: 908965: This is one of the 1969 Walnut Vs that Leslie West used in the early 1970's. 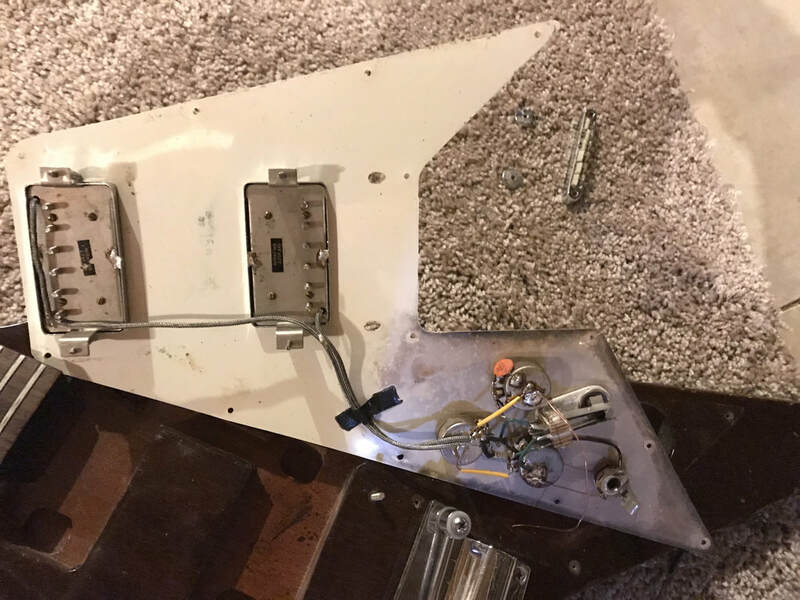 It was heavily modified, ie: Schaller tuners added, Vibrola tremelo unit removed and Stop Bar tailpiece added, and finally the bridge position humbucking pickup was removed and a dog-ear P-90 was added in it's place. 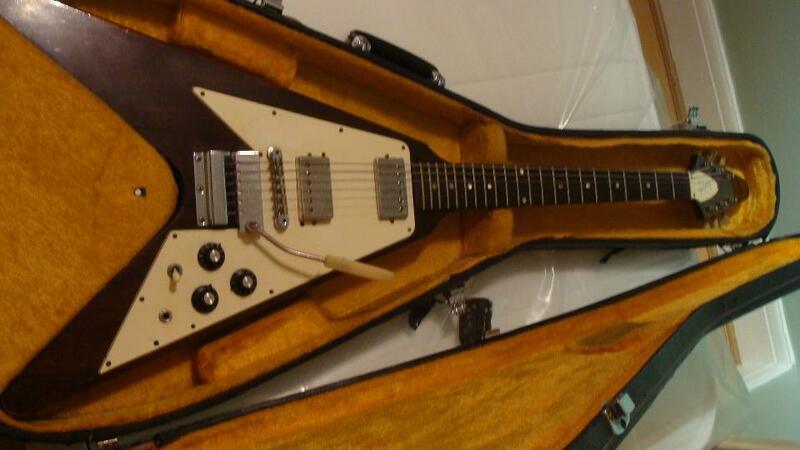 Here is another really good picture of the same V that was taken way back in 1974. Thanks Albert. 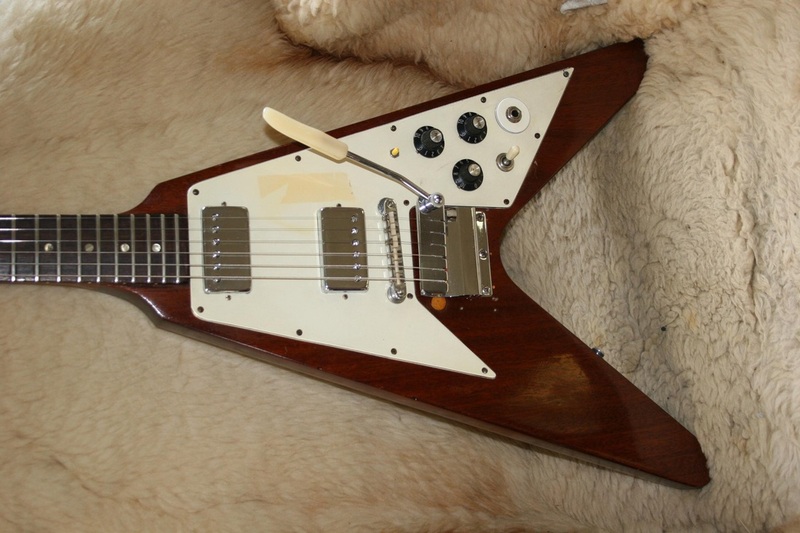 Leslie West's other 1969 Walnut Flying V was called the "Ash Tray". It was also heavily modified. The front humbucking pickup was removed and the hole left open. He actually dumped his cigarette ashes in the hole, thus the name "The Ash tray". It also had a dog ear P-90 installed at the bridge position just like his other one. The ABR-1 Bridge was removed and a Stop Bar Tailpiece was installed in its place. 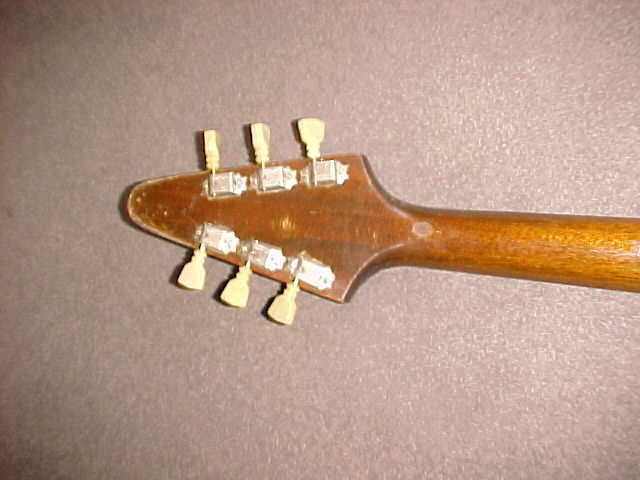 The lone P-90 was wired direct to the P-90's volume and tone pots. The other pot and pickup selector switch were removed. See picture below. Serial number unknown. Here is a picture of Wally Bryson of the Raspberries playing his 1969 Walnut Flying V. These pictures were taken around the 1973-1974 time frame. Serial Number: 907023. 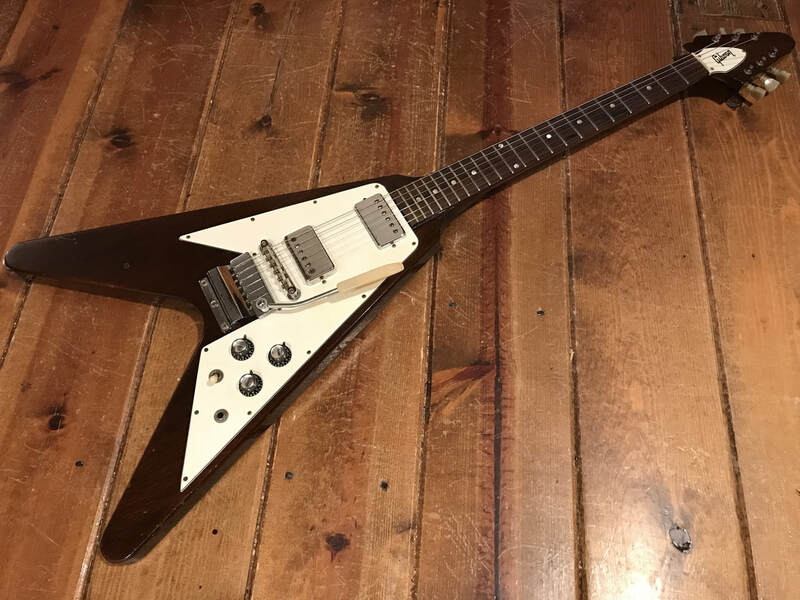 Here is another nice, clean '69 Walnut Flying V from Sweden that the current owner purchased from a music store in London, England in 1986. Pickup covers removed. 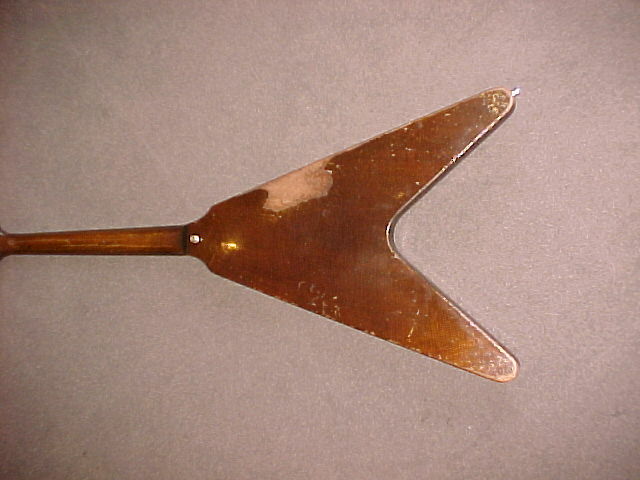 The truss rod cover and knobs are non-original. The ABR-I bridge posts were moved slightly backwards to help with intonation issues. 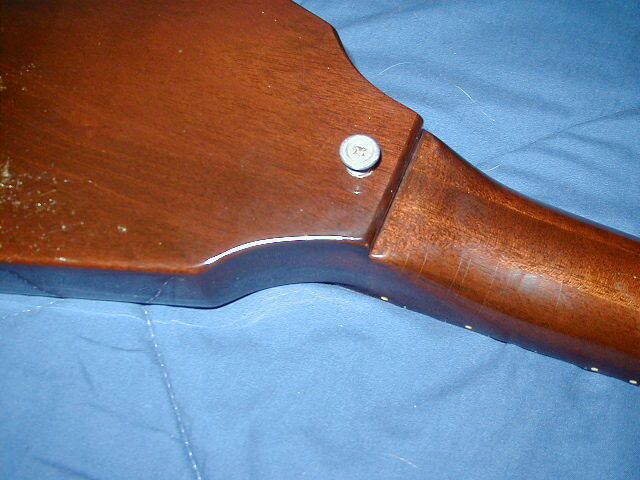 This was a common mode that was done to several 69 Walnut Vs. Thanks Johnny. Serial number: Unknown. 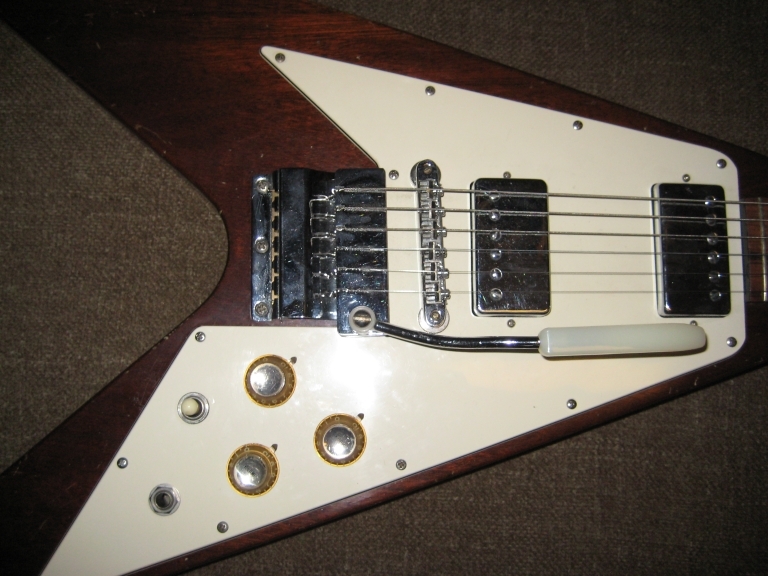 In the early 1970's Mick Ralph's owned a 1969 Walnut Flying V. As can be seen in the picture, he removed both the Vibrola Bar and the ABR-1 bridge and installed a Stop Bar Tailpiece where the ABR-1 use to be. He also changed the configuration of the control knobs. The pickguard has also been changed. This picture was taken in London on August 10, 1971 when Ralphs was still with Mott The Hoople. Serial Number: 907030. 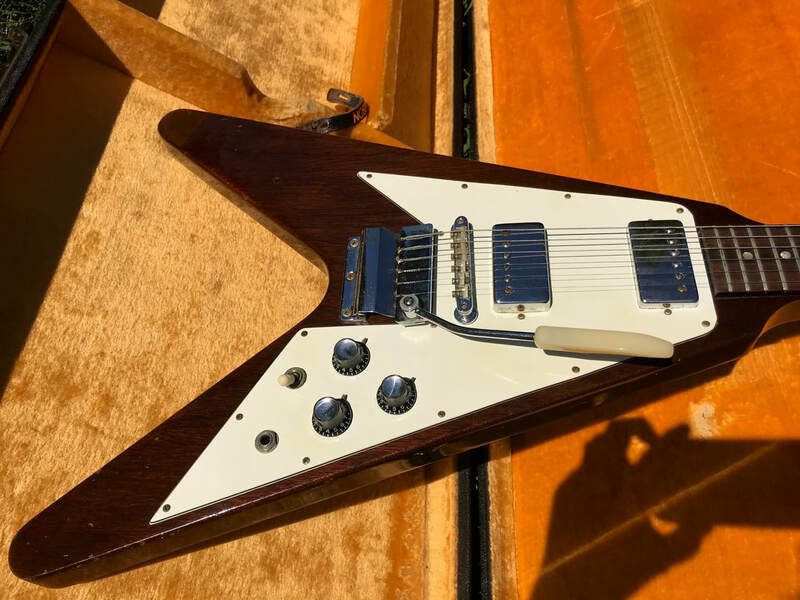 This is the story of the '69 Walnut Flying V that was once owned by Rickey Medlocke who is now playing with Lynyrd Skynard. 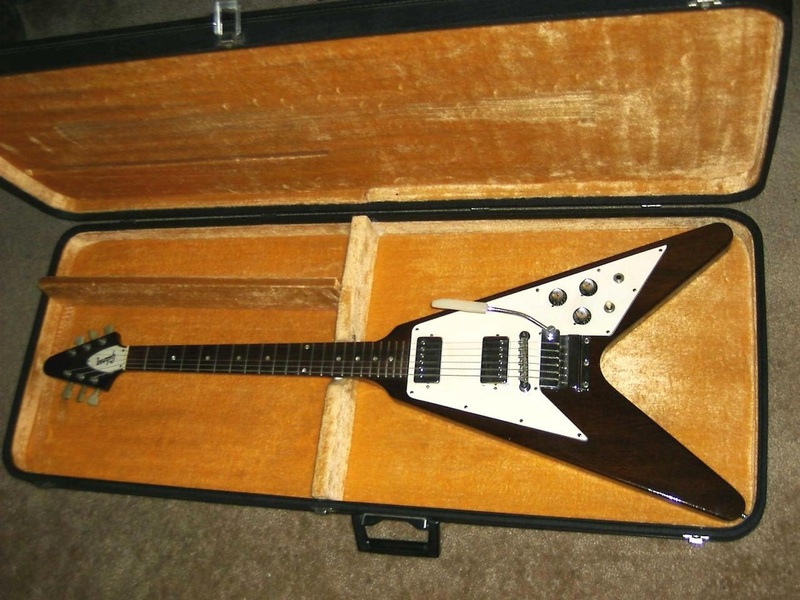 Back in 1979 the guitar was stolen off the tour bus when he was with the band Blackfoot. 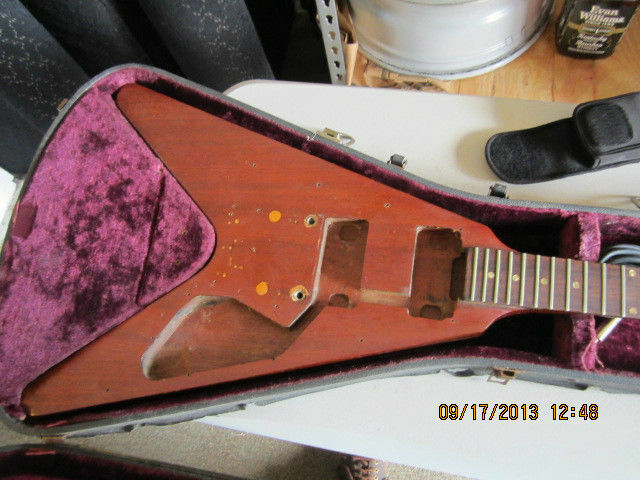 After 34 years, the guitar carcus (body only) and case were discovered at a garage sale in August, 2013 and purchased for $5. Wow, what a find ! 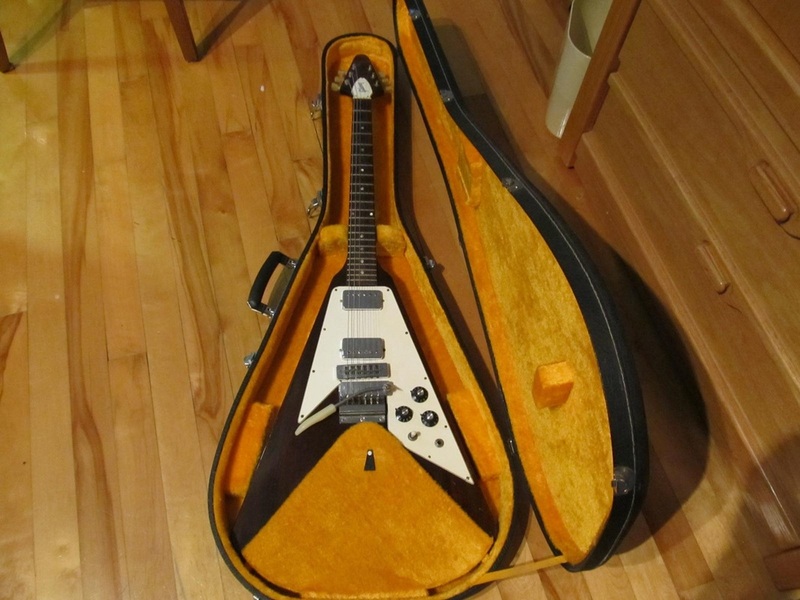 In December 2013 the owner put the guitar carcus and case, as pictured below, on E-bay. The V carcus and case sold for $4600. 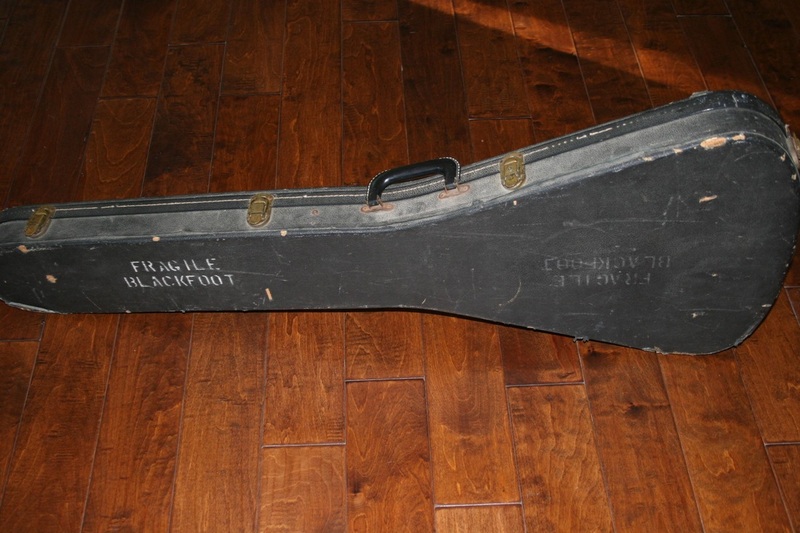 The case was stamped with the Blackfoot logo. Before the V was sold on E-bay, the seller sent several correspondences to Medlocke's agent. 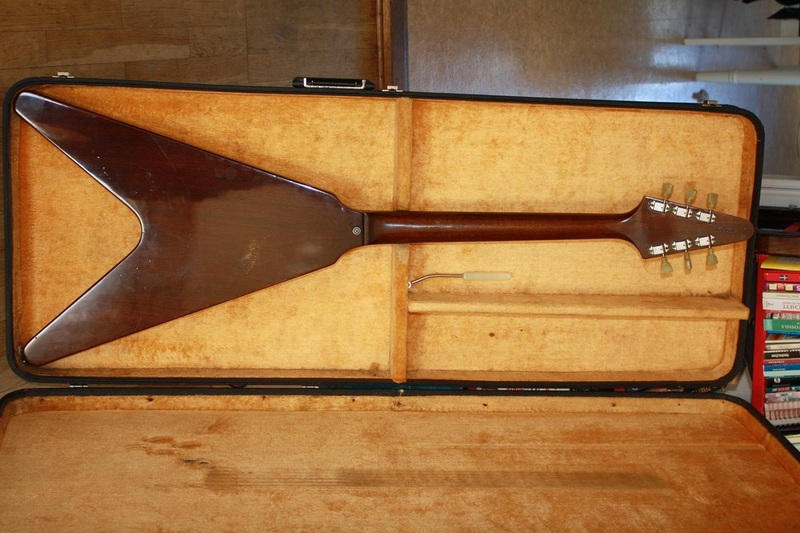 The agent confirmed the guitar use to be Medlocke's and he offered the owner a finder's fee offer of $2400. The offer was rejected. 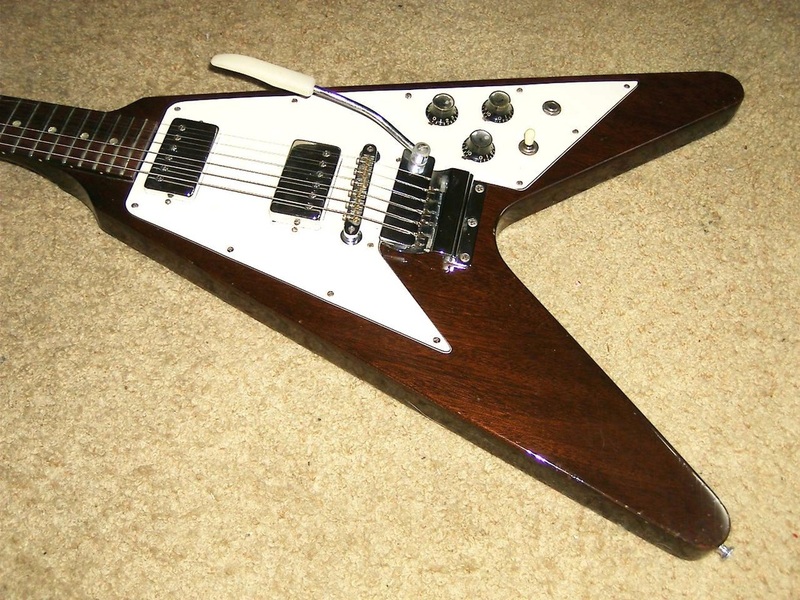 The current owner that bought the guitar off E-bay had the guitar restored to its former glory in April 2014. 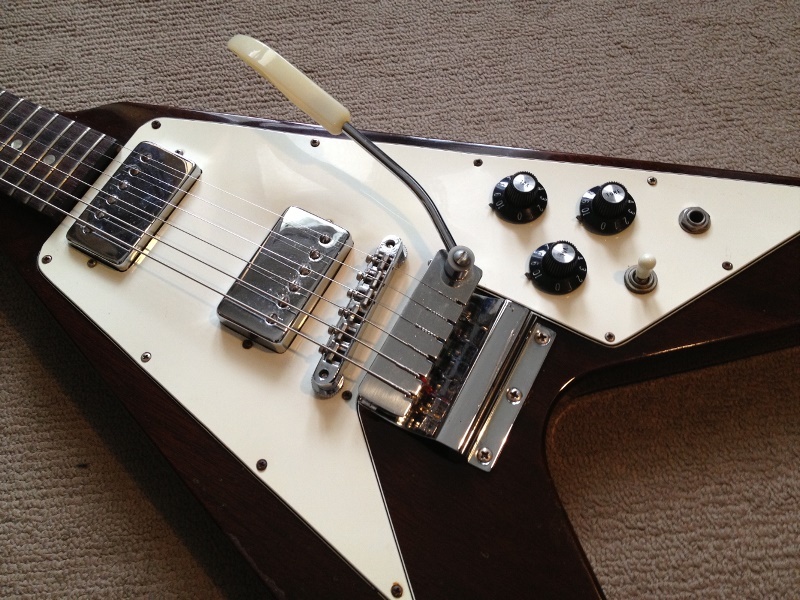 Scroll down to continue reading more of this amazing story about of this Flying V. 4/2014. 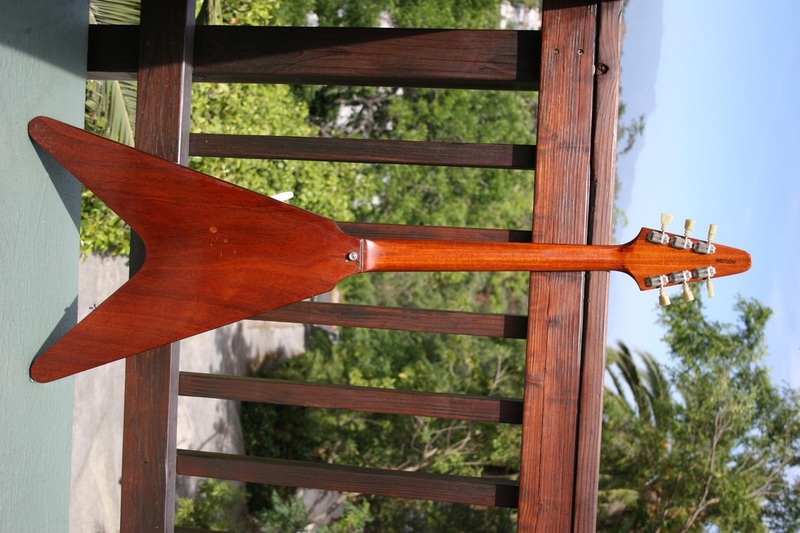 This is how the guitar carcus and case appeared when they were sold on E-bay in December 2013. 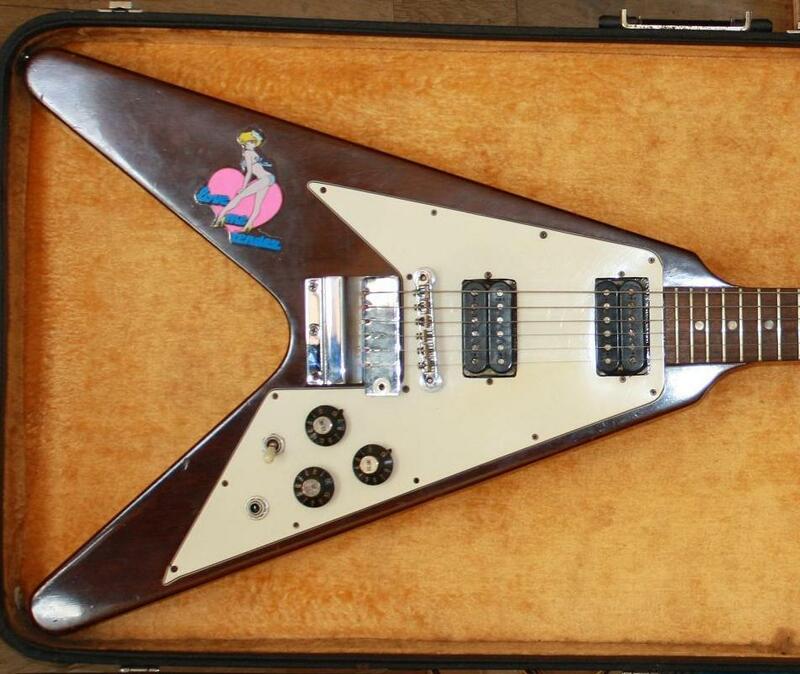 Notice the Blackfoot logo on the non-original mid-1970's Flying V case. 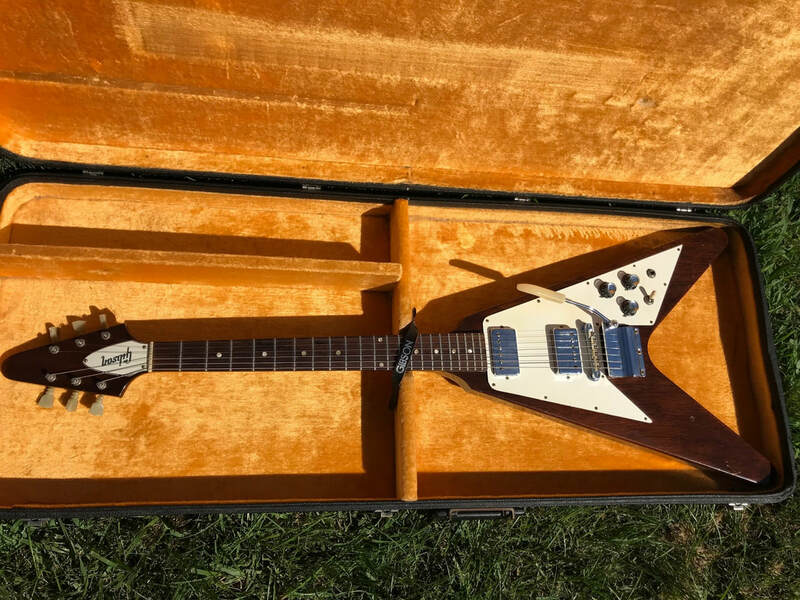 The story continues........Alan Collins of Lynyrd Skynard was pictured playing this same guitar in the early 1970's (probably 1971). See pics below. Rickey Medlocke let him borrow the guitar for a few years from 1969 to 1971. During that time Rickey played drums for Lynyrd Skynyrd. Notice the guitar has a Hopf tremelo unit. 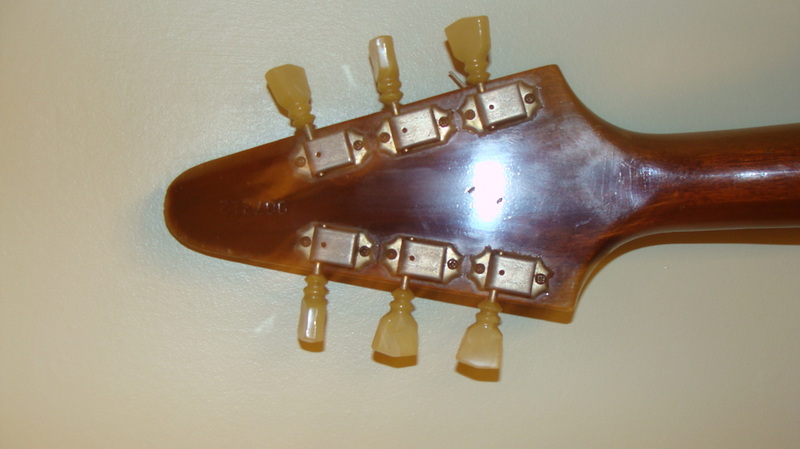 Some of the screw holes from the Hopf tremelo unit correspond to the filled-in screw holes on the same guitar pictured above. 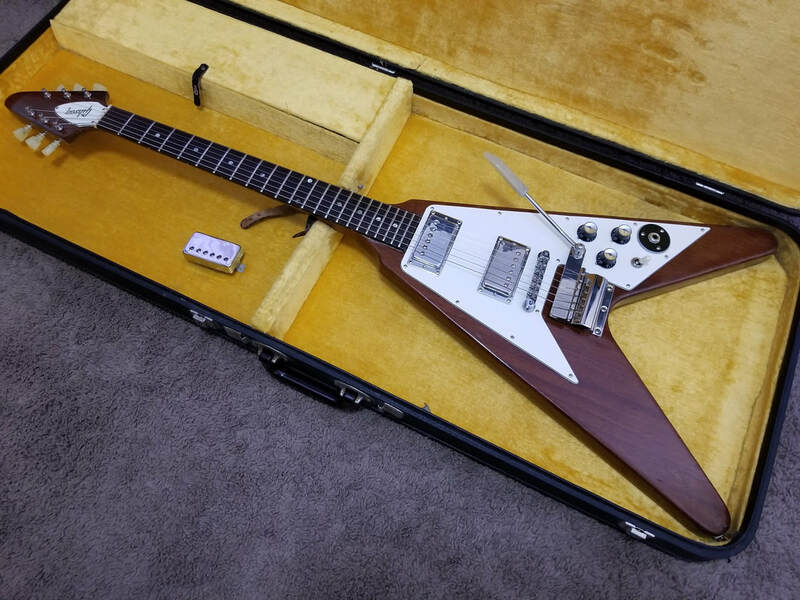 Some sources say the V pictured below was actually black, but recent events, including Rickey Medlocke's agent authenticating the guitar, would indicate it is most-likely the same walnut Flying V pictured below. 4/2014. Serial number unknown. 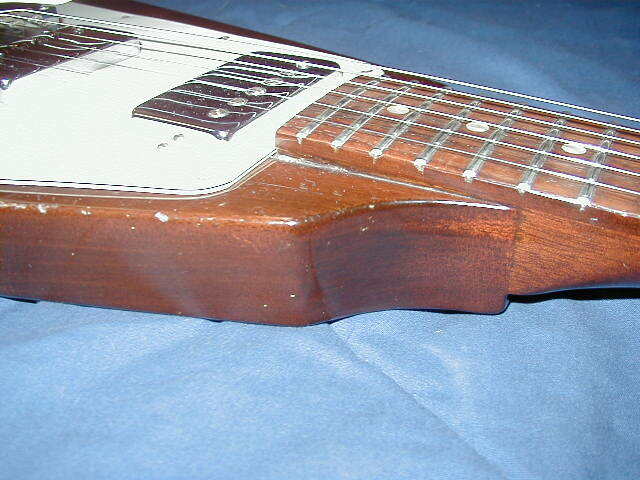 Here is a '69 Walnut that has a modified tailpiece. 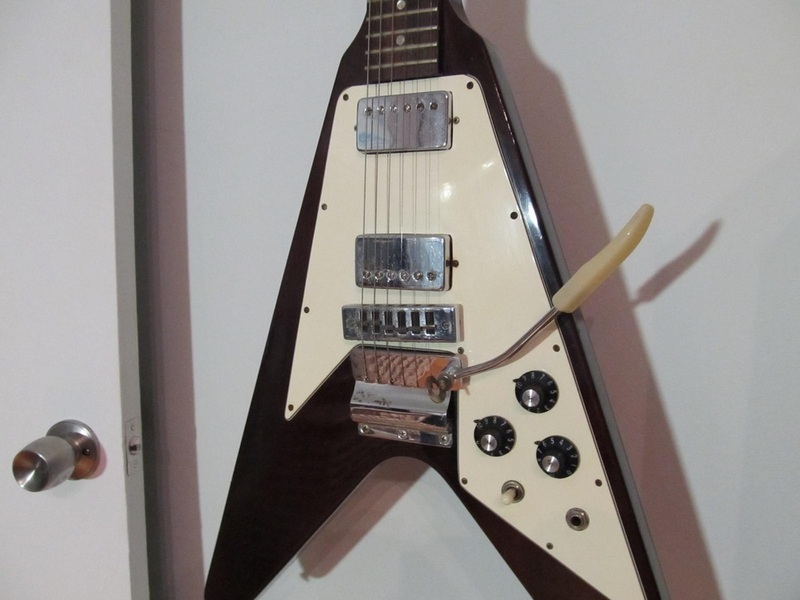 One of Rudolph Schenker's sparkling burgundy Vs has the same style of modified tailpiece. 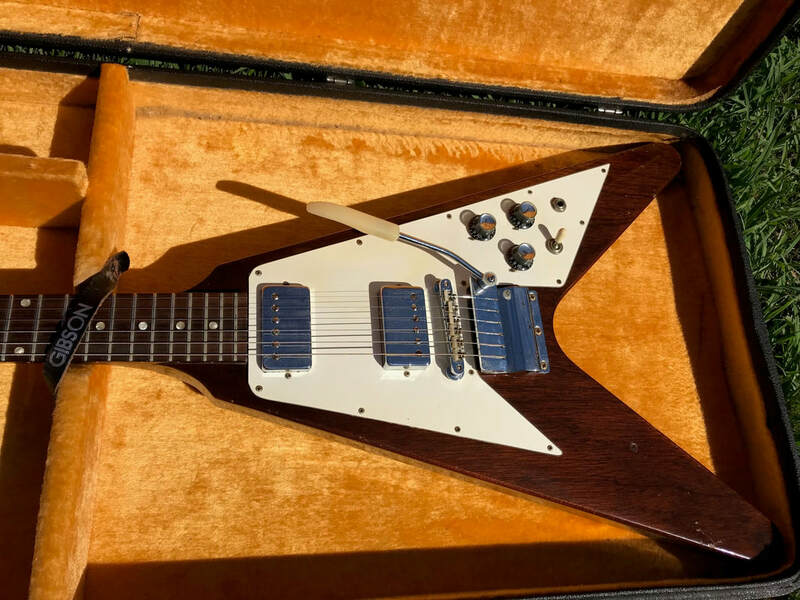 Serial Number: 906932 Here is another beautiful, totally original Batch #5 Walnut Flying V. This guitar is factory original and unmolested and has it's original square case. Thanks Dan. Posted 11/7/15. 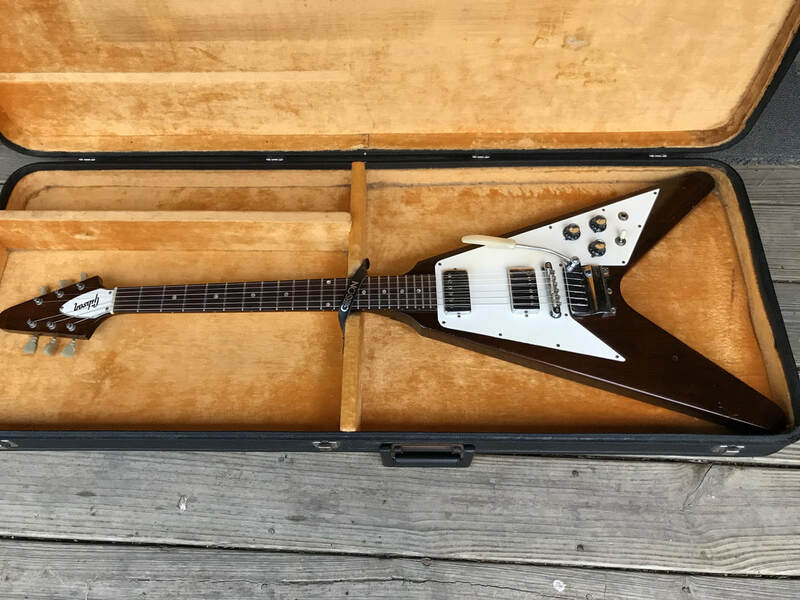 ​Update: I purchased this V from Dan in July 2018. ​Serial Number: 907241. 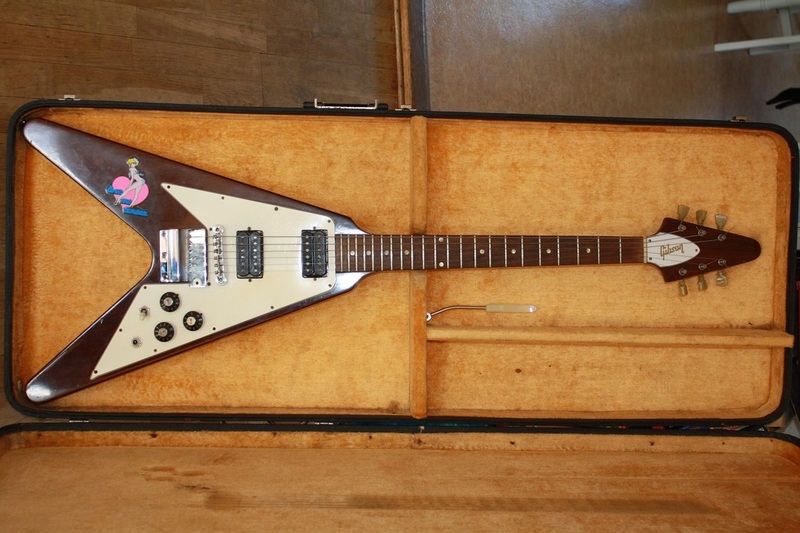 Here is a nice '69 Walnut Flying V has been in Japan for many years. It is thought to be 100% original and unmolested. Added March 2019. Serial Number: 906966 Here is an amazing V. This is perhaps the first of the Batch 5 Walnut Vs produced. 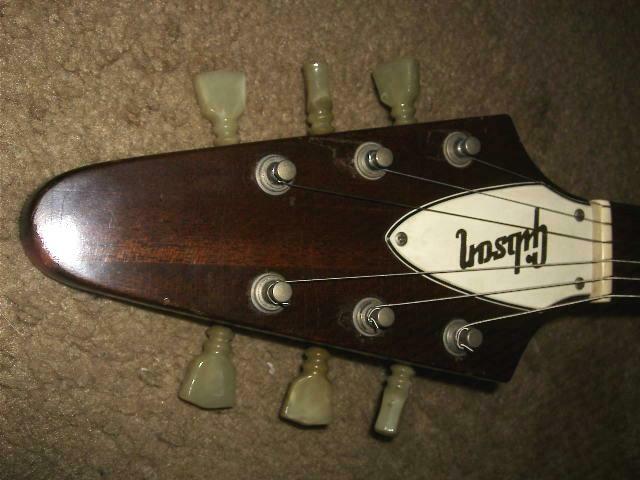 This is the only one that has ever surfaced with a black headstock front . 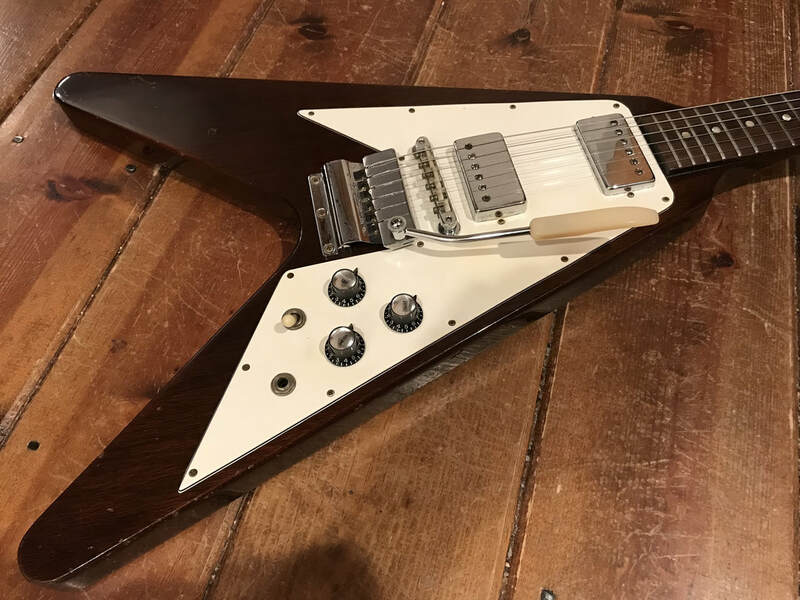 This V has all of the characteristics of the Batch 5 Walnut Vs except for the black headstock, Kluson tuners (not Gibson) and the multi-colored wiring harness like the Vs from Batches 1 - 4. All of the other Batch 5 Walnut Vs that have surfaced have the wiring harness with all yellow wiring. Also, notice the short neck shelf which is typical for all Batch 5 Vs.
Sold in September of 2017. Images provided by Atoyboy Guitars in England. Thanks Mike. Posted Sept. 2017. Short neck shelf typical of all Batch 5 Walnut Flying Vs. Serial Number : 954861. This is one of only five Batch #3 or Batch #4 Gibson Flying Vs with an all walnut finish and black headstock. This guitar has all of the distinct features of the Batch #3 and Batch #4 Flying Vs, including the longer V shaped neck shelf. It also has a one piece neck, multi-colored wires used on the electronics, black headstock, Kluson Deluxe tuners and wider Vibrola plate. 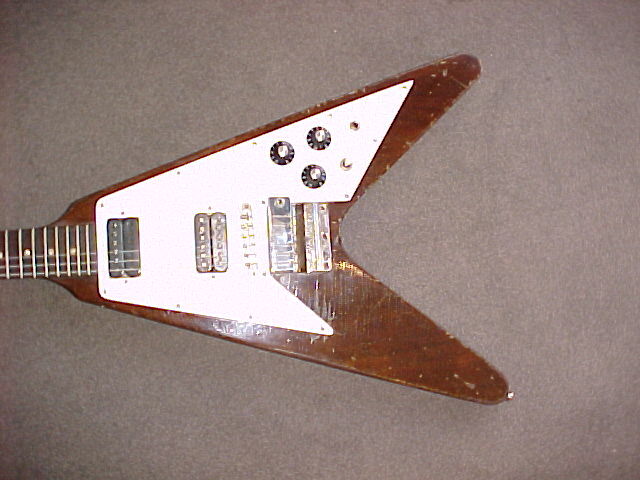 Another Walnut Flying V with black headstock was probably made on the exact same date as this one. Its serial number is 954860. It is also featured below. The common serial numbers from Batches #3 and #4 were 920xxx, 932xxx, 940xxx and 95xxxx. 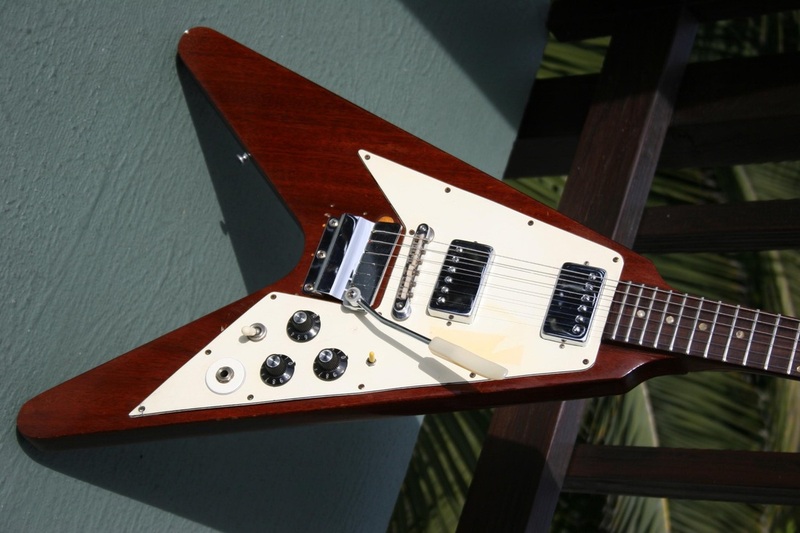 Due to it's higher serial number, this guitar, and its same-day twin were perhaps two of the last of the Batch #4 Flying Vs. It could also be a 67 V that was later completed in 1969 with the rest of the Batch #5 Walnut Vs, but that is sheer speculation. The pickup rings rings shown in the picture below are not original and were added sometime before 1994. 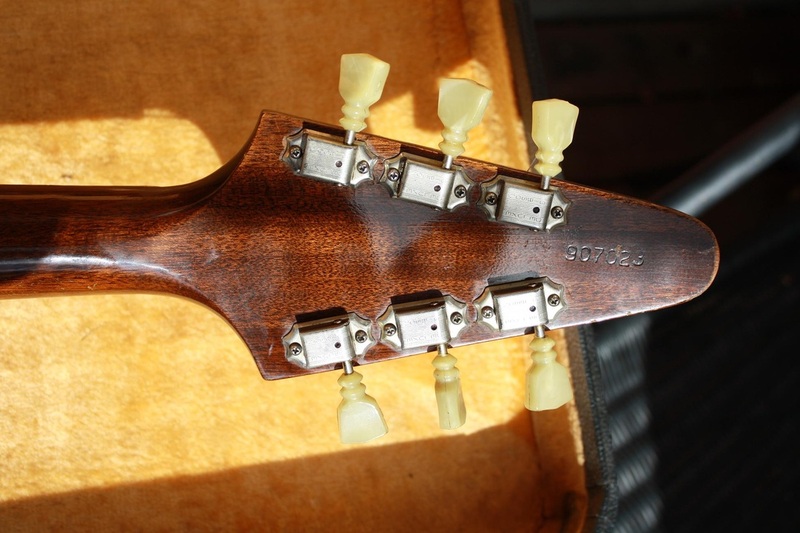 Thanks to Francesco for providing the pictures of this amazing guitar that he purchased in 1994. 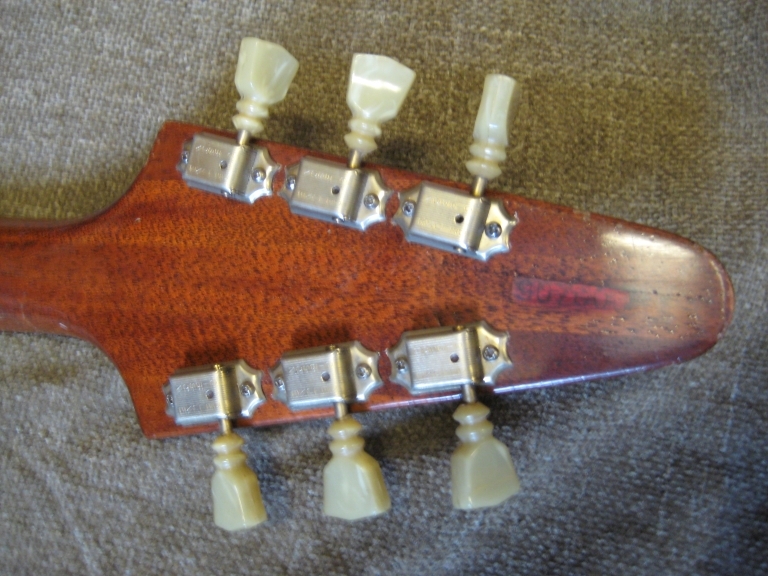 Notice the long V shaped neck tenon, typical of later Batch #3 and all Batch #4 guitars. 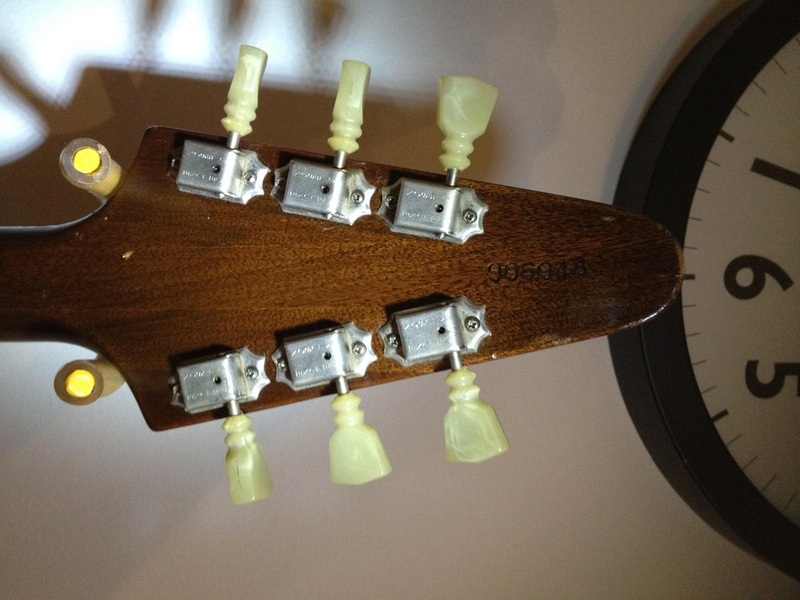 Notice the Kluson Deluxe tuners and one piece neck. Serial number 954860: Here is the twin brother of the guitar pictured above (954861). Both of these guitars were probably built at the same time. It is all original with the unfortunate exception that 4 additional screws were added to the pickguard. Notice the black headstock. Thanks for the pictures Janice. This guitar was owned by her late husband. Posted Feb 2017. Serial Number unknown. 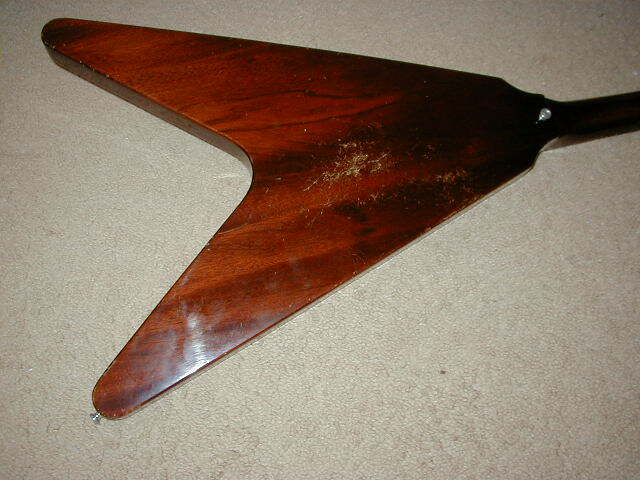 Here is another Walnut Gibson Flying V that was most-likely another Batch #4 guitar. This guitar has all of the same characteristics as the three Walnut Vs described above. Notice the extra visible wood between the lower edge of the Vibrola plate and the pickguard just above the toggle switch and upper knob. 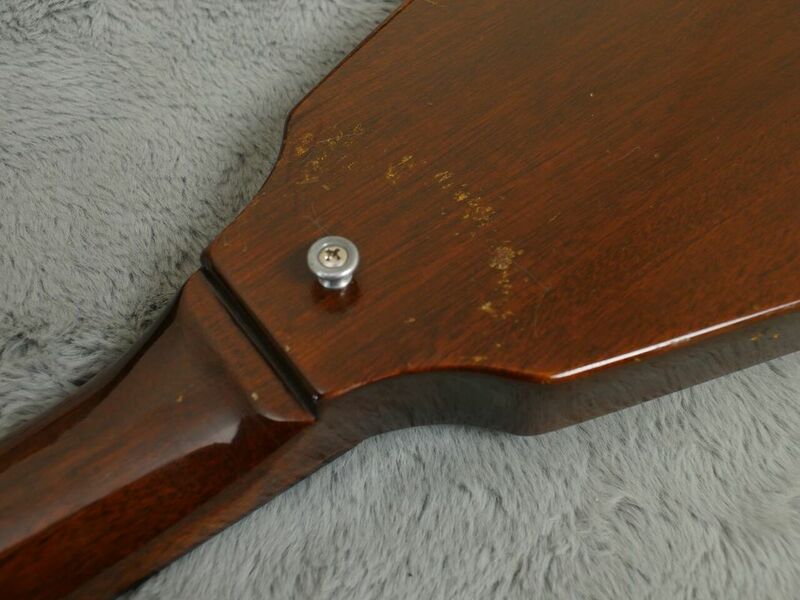 This indicates a smaller, 1975 era pickguard has been installed. You can barely see one of the mounting holes for the larger original pickguard. 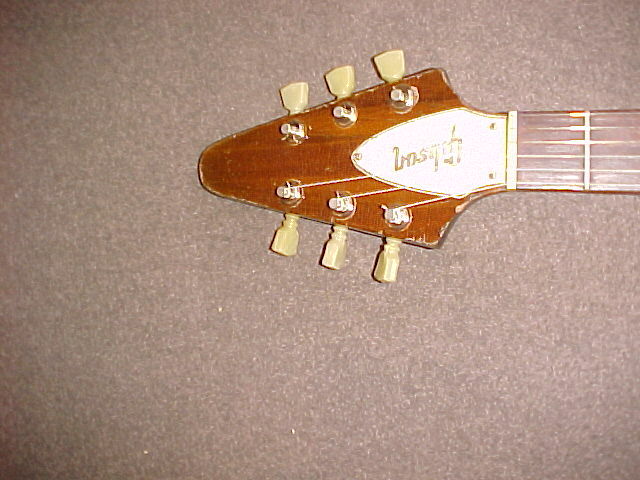 Notice the Black headstock. This one also escaped the dreaded Grover mod. Serial number: 940134. 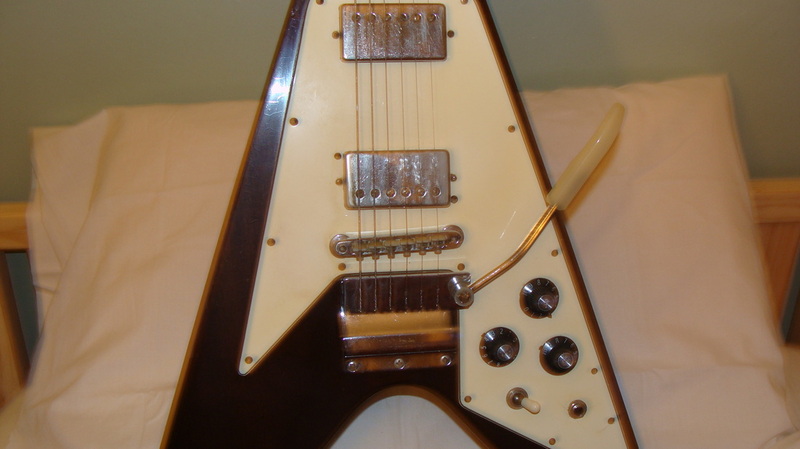 Here is another 1967 walnut Flying V. Surprisingly, this one is from Batch #3. This one has the 940xxx serial number, which was used exclusively on the Sunburst and Sparkling Burgundy Vs from Batch #3, until this one showed up. 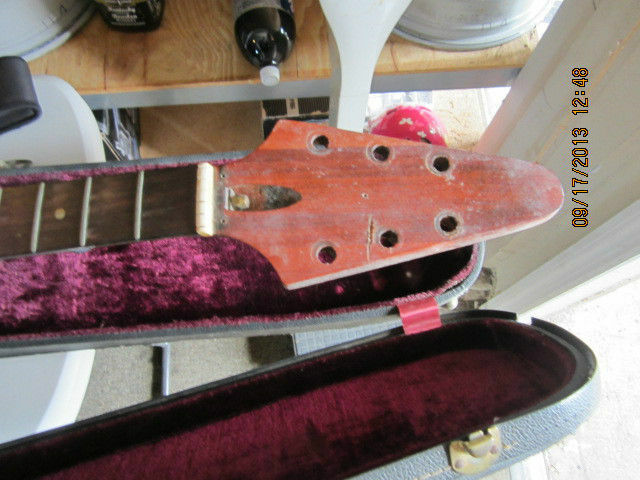 Originally, the headstock was black as it should have been. However, the owner refinished it to walnut. At one time it also had Schaller tuners. 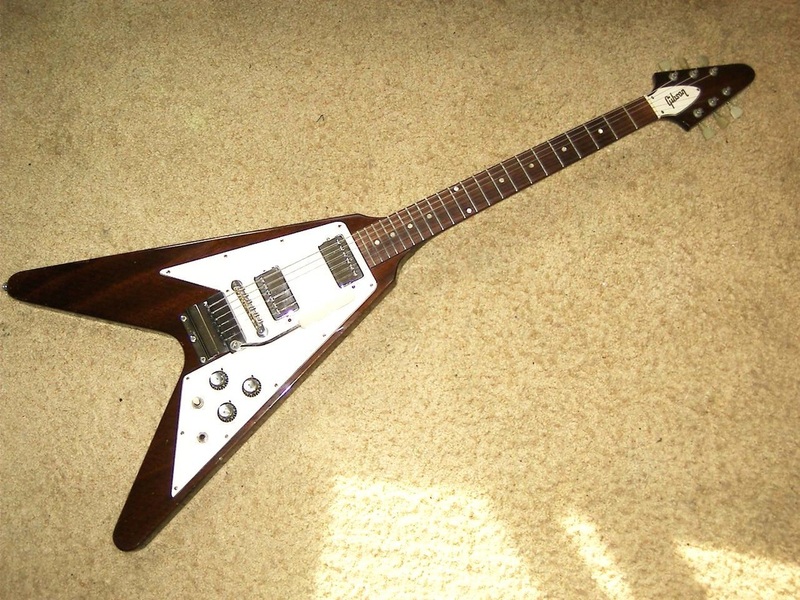 The current owner purchased this V second-hand in 1976 for $700. Thanks for the pictures Jack. Posted March, 2019.